Does this have spoken directions? (audio)? Does this work with ubuntu? great woot i think…does this contain the roads for even small rural towns? The unit is bright, Crisp and big… Touch Screen seems to work pretty good… Probably the best thing this has going for it is that it pick up GPS signals well and is fast in doing so… It does seem to get you to where you want to go tho. The back light when it gets dark it reverses the screen is a nice touch. Why have the Voice at all ??? IT doesn’t speak the street names … Right or Left (BING) … I use MUTE it really is annoying as hell. AAA trip that has all the location for banks or what not… USELESS… Might as well just drive around looking for them since it hardly picks up even 40% of them in my town. OK, So maybe you want to update this machine? Yeah, they give a USB cable. Ok, WHY? You have to back it up if you want to update it. Well, you gonna need a memory card… Nope don’t look in the box, and it’s that old style ram you can’t just get out of your digital camera… I have my doubts that it would do much good updating the unit anyway. I really just wanted to load the software so I could key in my addresses via google maps or whatever. NO…No…NO… The software is USELESS! You can’t just import you gotta type out this screwed up format … Witch brings us to the keyboard and why you would want to do use your computer for inputting address’s in the first place. The keyboard is ABCDEFG Keyboard not a standard lay out. No way to switch or no options. 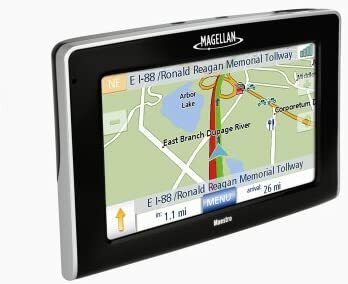 How hard would it be to make a GPS interact with goole maps or microsoft maps? Or any map? A gave it two stars … As it is good for just seeing where your at… But in todays world I think for 2-300 bucks they could have better a interface… I would stay away from Magellan. Borrowed one of these recently when going to LA. It was awesome. Really tempted to buy one for myself now. The maps are over a year old. If you’re good with that, great. I’m not though. If you live in CT, don’t even bother… Magellan will take you for a spin I returned mine. i’ve got the 3200, and if i’m correct, the 4200 is the previous version of the next model up, currently the 4250. so this probably has a few little features more than i’ve got, and i paid $200 for mine earlier in the year. great device, love it and i’ve used it a lot more than expected. got it mainly for those road trips i take a few times a year, figured it’d help out navigating and finding things in cities i don’t know too well. but heck, i’ve used it around here locally even at times. good product and looks like a pretty good price. Got one of these last Turkey day. I like the intuitive software. Normal GPS oddities (most direct route, etc) but compared to my first one, A all-in-one Polaroid (GPS, DVD, and MP3 player), it’s a vast improvement. Would this make a good camping/hiking/sailing GPS device? I mean, does it deal with altitude or water depth at all? Or is this perhaps more suited for just navigational use in your car? Or both? ?